Performance of science subjects in Uganda is declining, with some districts registering very few or no science students at A-level. The poor status of laboratory education and industrial laboratory services across the country and region are the likely causes. Competent and all round skilled laboratory science technologists, trainers and service providers are either inadequate or missing all together across sectors, and where it exists, the competences are diverse and not properly harmonized. 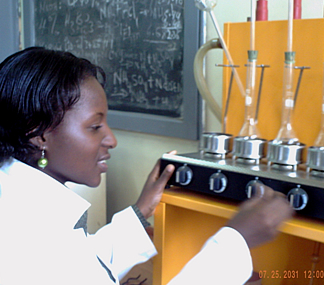 School laboratories, are inadequately managed, equipment dilapidated and science education quality is low. This trend will have negative impacts on the government policy of compulsory science subjects at O-level certificate. This programme has been designed to address the above challenges, and enhance the profile, relevancy and application of laboratory science, technology and education at all levels. It will enhance science education while promoting production, productivity and employment. In line with government efforts to promote science and technology, the programme will equip students with skills relevant to laboratory science, laboratory business, laboratory education, laboratory investigation, research and innovations. Students shall be empowered with technical skills specifically aligned to teaching, education, research and industrial operations. Minimum Programme Duration:One year for Certificates, two years for diplomas, and three years for degrees. Target group:Those interested in building attractive industrial, business, professional and service careers associated with laboratory science.